On the corner of South Jeffery Boulevard and East 79th Street, sits a “Blue Jewel” hidden in a plain stone exterior. The staid and sober facade of Our Lady of Peace Catholic Church belies its interior—a large, open structure of carved plaster and woodwork with a ceiling of ornate designs and geometric patterns, nicknamed for the abundance of blue terra cotta that gives the space a faint cool glow. Lining the walls are two rows of stained-glass windows that depict the apostles and biblical scenes. 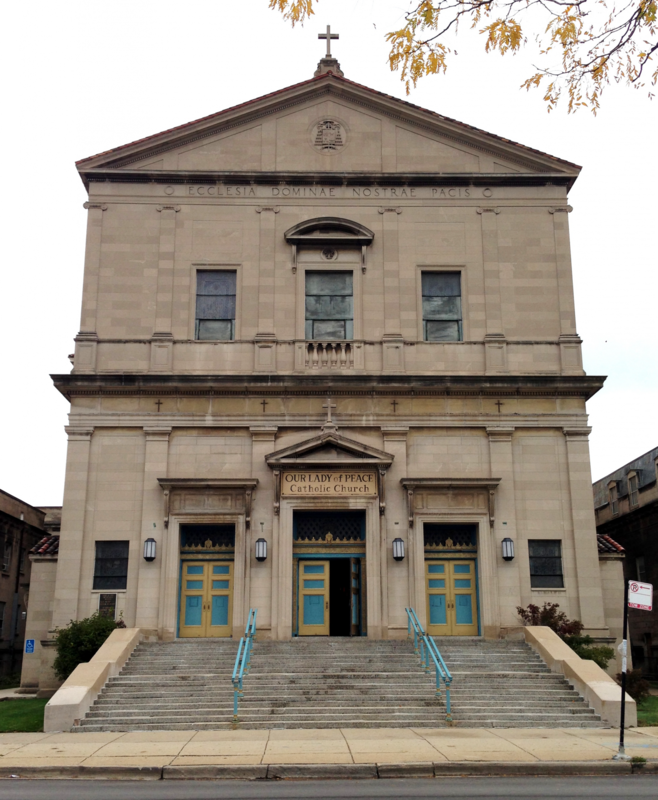 Today, Our Lady of Peace is the official host of the Haitian Catholic community of Chicago as well as the local parish church of the neighborhood’s Catholic community, but the 95-year-old church has had a long and diverse history. Our Lady of Peace was founded, the story goes, by a priest who fought in World War I. Seeking divine assistance in deciding whether he should fulfill his dream of building a church, the priest believed that he had finally received a sign from God when he came across a soldier on the battlefield who was confused, unarmed, and separated from his regiment. The soldier told the priest that he was lost, but that an unknown woman with open arms had appeared before him and led him to the priest. The priest then hid the soldier in a foxhole, saving his life. When he returned to Chicago after the war, the priest founded the church in 1919. Designed by architect Joseph W. McCarthy, the structure was completed in 1935. 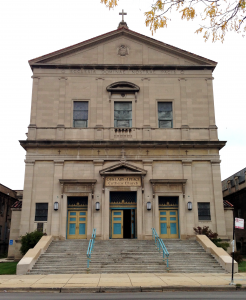 Initially, it was home to the Irish and German Catholic communities of the South Side. The African-American population began to attend its services in the early 1960s, but they did not form a large portion of the parish until the 1970s. Within the past decade, it has become the official center of the Haitian Catholic community, and it now holds services in both English and French. In fact, according to parishioners, the French mass is far better attended than its English counterpart. Despite the church’s strong ties to the Haitian community, the parishioner population has been dwindling. The question of greatest concern to the current members is the church’s survival both as a physical structure and as a community of worshippers. Like many other urban churches, Our Lady of Peace is searching for ways to retain younger members who are either leaving for the suburbs or abandoning their parents’ faith. The closing of the parish’s K-8 school about fifteen years ago is indicative of this decline. Although the Shrine of Christ the King remains only partially furnished, the delicate beauty and rich history of the church do not fail to strike the worshipper, community member, or casual visitor. 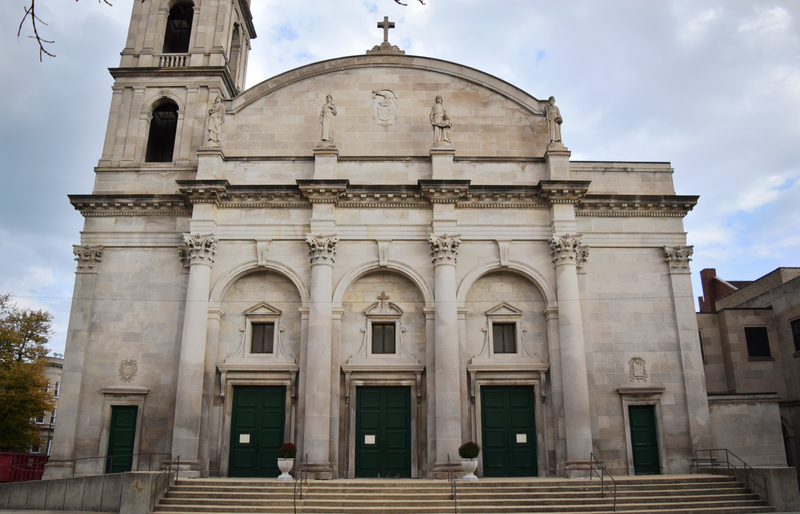 The Shrine was built by Chicago architect Henry J. Schlacks in 1923, modeled after a tower that lies on the Seven Hills of Rome. The Shrine’s story is closely linked to the history of the surrounding neighborhood. Gang activity became more prevalent in the Woodlawn area with the rise of the Blackstone Rangers, later the Black P. Stone Nation, in the 1960s. A fire destroyed most of the interior of the church in 1976, during a time when it was common to see buildings in the area go up in flames. Whether the fire was an accident or arson is unclear, but the Shrine is still recovering from the disaster. Even now, the church lacks utilities, and its intricate ceilings and floors have yet to be replaced. Following the fire, the building was closed and scheduled for demolition. It wasn’t until 2003 that Cardinal Francis George, Archbishop of Chicago, entrusted the church to the Institute of Christ the Sovereign King, a body that had previously restored churches elsewhere in the country. The institute restored the church and officially named it the Shrine of Christ the King Sovereign Priest in 2006. The church’s near demise and exciting recovery have accompanied other developments in Woodlawn. New and restored houses and condominiums have appeared around the church in the past few years, and the area is quickly becoming a popular destination for people interested in neoclassical architecture. The Shrine is now home to the monthly Great Devotion to the Infant King, the centerpiece of which is the church’s main altar, an 18th century statue of the Christ Child, imported from Spain. A new organ system has also been installed in the Shrine, though music must be enjoyed on the church’s donated or handmade provisional furniture. One of the few churches that still offers a traditional weekly Latin Mass, the Shrine also hosts devotions, spring and fall concerts, and many other artistic, musical, social, and educational opportunities for the community. The Latin Mass is often performed for a full house, as the Shrine attracts people—primarily Roman Catholics—from around Chicago and around the world. But the majority of worshippers are from the immediate area, and they appreciate the Latin liturgy as a highly traditional form of Catholicism. 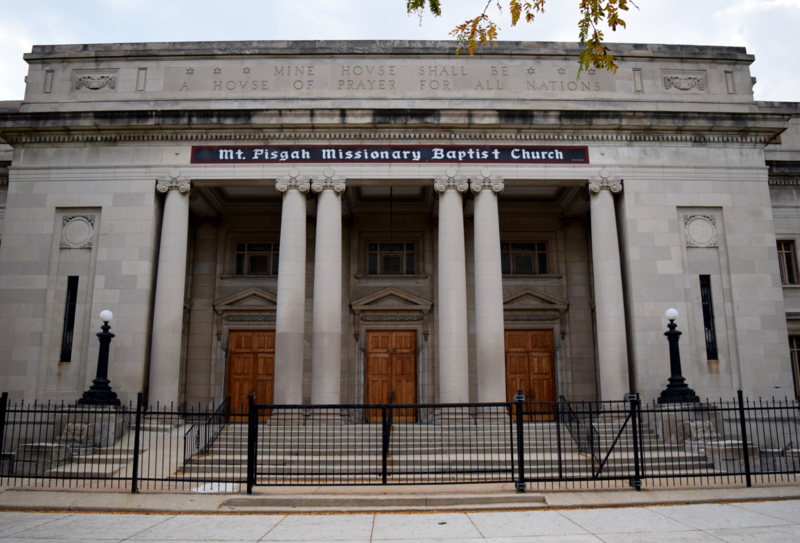 In the vast sanctuary of Mount Pisgah Missionary Baptist Church, a large cross sits front and center, presiding over a sign that proclaims the church’s name in blue letters. Just feet away, Stars of David, intricately carved and painted white and gold, decorate the walls and ceiling. The interaction of these two distinct symbols exposes the history of this Grand Boulevard building, which has changed hands three times in the last century. Mount Pisgah was built in 1912 and designed by Chicago architect Alfred S. Alschuler for the Reform Jewish Chicago Sinai Congregation, which dates back to 1861. At the time, the area was populated mainly by German Jews and other Europeans, and full of Jewish-owned businesses. In its mission to create a social and intellectual center as well as a house of worship, Sinai also built classrooms and a gymnasium. However, with the onset of the Great Migration, Grand Boulevard soon went through a period of racial transition. Many Jews left the neighborhood, and African-American residents began to move in. 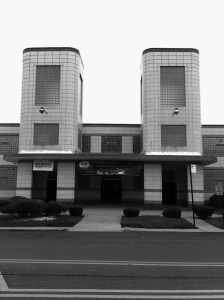 In 1944, Chicago Sinai left for a new home while their former building’s classrooms and gym were converted into a new African American Catholic school, Corpus Christi High School. 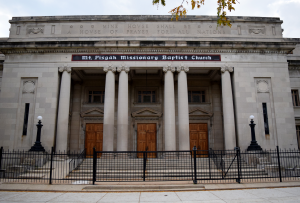 In 1962, Corpus Christi sold the building to Mount Pisgah, a Baptist congregation that still holds the space today. Much of the original architecture remains, including dark woodcarvings that frame the organ pipes, stained glass windows, and the many Stars of David. “This was once the church of fashion,” John Stenson proclaims, standing in the aisle of the First Church of Deliverance at 43rd and Wabash. He’s a trustee (their term for deacon) at the church, dressed neatly in a black suit with purple tie and white shirt. The church came humbly into being in 1929. Reverend Clarence H. Cobbs established the ministry in a former hat-lining factory, and the original altar was fashioned from the pastor’s mother’s ironing board. 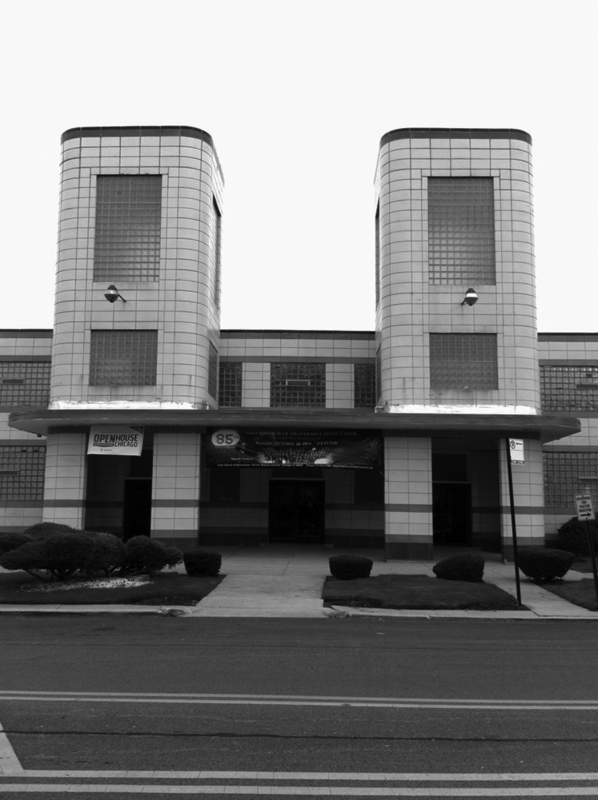 In 1939, Walter T. Bailey, the first licensed African-American architect in Illinois, designed a façade and interior for the building in the Streamline Moderne style, a late form of Art Deco architecture whose horizontality and curves constituted a stripping-down of more elaborate earlier designs. The lime green walls inside echo the bands of green tile on the exterior. Flanking the altar, the two choir sections are sheltered by a low, stepped wall, its curving chrome border almost reminiscent of a 1950s diner. Stenson, a lifelong member of the church who has served under four pastors, recalls the days decades ago when the church’s 1100 seats were nearly full for weekly services. “You could hear [the choir] a block away,” he says. “We just don’t have that kind of entourage today.” Stenson estimates that the congregation has fallen to about 175 people. Today, the same features that once accounted for the church’s popularity have made holding on to members hard. Cobbs wrote many of the hymns that became FCD standards, including “Jesus Is the Light of the World,” a slogan that appears on the church’s exterior sign. The church choir continues to sing hymns in this older gospel style with sparse instrumentation, choosing not to introduce the “hip-hop hymns” that Stenson says younger generations want to hear, and can find in megachurches across the South Side.